October 30, 2013  Only one team has a chance of winning the World Series tonight in Game 6: the Boston Red Sox. The St. Louis Cardinals have a chance to lose the series — or they can force a decisive Game 7 at Fenway Park tomorrow night. Boston fans are paying top dollar for the chance to see their team clinch a World Series at home — something that hasn't happened in 95 years. 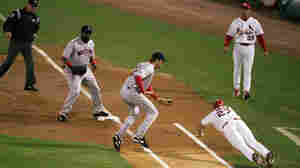 October 27, 2013  Game 3 of the World Series ended in unusual fashion Saturday night, as a ninth-inning obstruction call on Boston third baseman Will Middlebrooks resulted in umpires awarding a base to St. Louis' Allen Craig — bringing the winning run home and putting the Cardinals ahead in the series, 2-1. October 26, 2013  The all-tied World Series resumes tonight, with Game 3 between the St. Louis Cardinals and the Boston Red Sox. Ahead of the game Saturday, the main storyline centers on the change of venue to a National League park, forcing Boston to adapt. October 19, 2013  One key inning. One key at-bat. The result: St. Louis heads to its 19th Fall Classic. 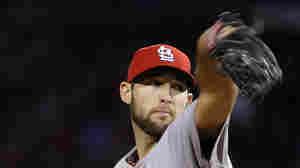 The Cards will face either the Boston Red Sox or the Detroit Tigers. Those teams play again Saturday night. October 23, 2012  The San Francisco Giants came back to beat the St. Louis Cardinals 9-0 in Game 7 of the National League championship series Monday. They face the Detroit Tigers in the World Series. October 1, 2012  It wasn't clear whether the Nationals' Michael Morse had hit a grand slam. When the umps decided he had, they made him go back to home plate and pretend he'd done it again. See the video. 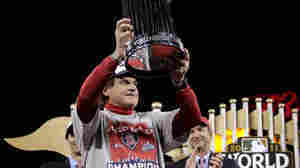 Cardinals manager Tony La Russa celebrated with the World Series trophy Friday night in St Louis. October 31, 2011  The baseball team's skipper won his third World Series title on Friday. A sure-fire Hall of Famer, he has the third-most wins in Major League history. Celebration: The St. Louis Cardinals spray Champagne after Game 7 of baseball's World Series against the Texas Rangers in St. Louis. October 29, 2011  The team that in late summer didn't look like it would even make the playoffs came from behind again to defeat the Texas Rangers 6-2 in Game 7. For the Cardinals, it's the team's 11th World Series title. Texas is still looking for its first. David Freese of the St. Louis Cardinals celebrates at home plate after hitting a walk-off solo home run in the 11th inning to win Game Six of the MLB World Series against the Texas Rangers in St Louis. October 28, 2011  There's a new name in the long list of World Series heroes. 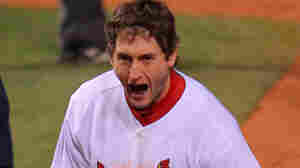 David Freese. 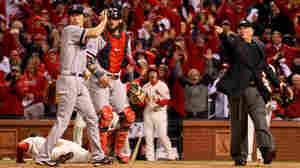 The Cardinals third baseman sent the game into extra innings and then won it in the 11th with a solo home run. St. Louis beat Texas 10-9. Game 7 is tonight.